A striking, low growing plant, that reaches up to 3’ tall, offsetting heavily with big, round, rosettes, that have a fantastic dark bronze color in full sun. Hybridized by Jack Catlin when he crossed ‘zwartkopf’ and tabuliforme. Three plants emerged, with one not being able to survive. 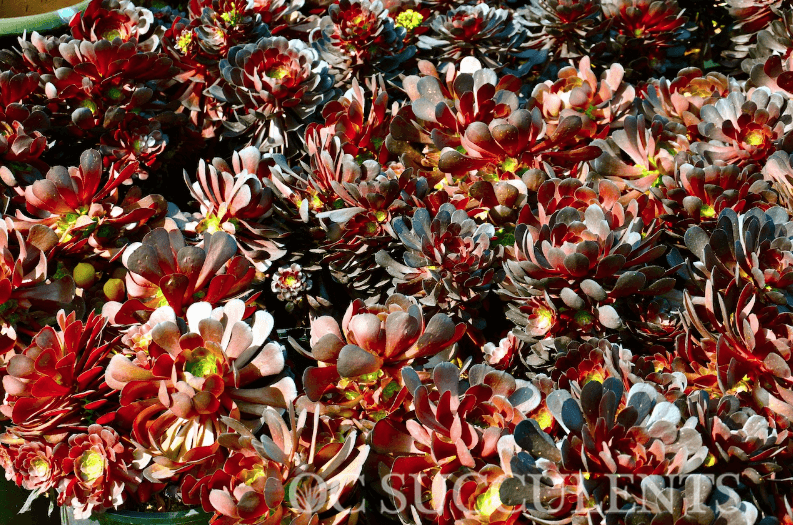 The other sister plant being aeonium ‘zwartkin’, very similar to ‘garnet’ with a slightly different leaf structure and color. ‘Garnet’ shows the low growing nature of tabuliforme and the deep color of ‘zwartkopf’.